I've been known to occasionally put my husband's needs and wants ahead of my own. 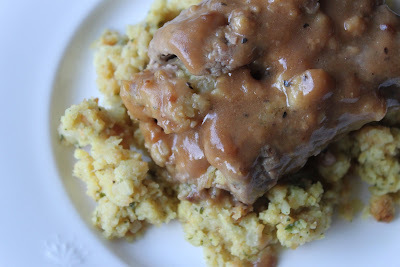 You see, there's nothing the man loves more than meat...in gravy...with stuffing. So, here you go! All kidding aside, this was really a delicious meal. It was warm and comforting. 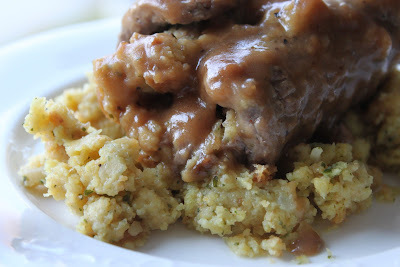 The stuffing comes together so quickly and I was able to serve the steaks over the leftover stuffing so I didn't even have to make an extra side. You could, of course, serve these over rice or mashed potatoes. Prepare stuffing mix according to package directions, adding a little extra liquid to make it extra moist. 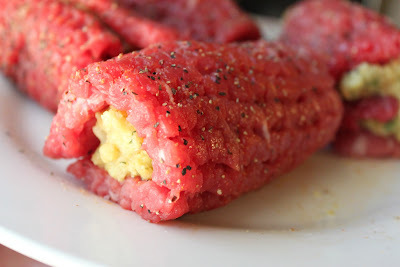 Place a heaping spoonful of stuffing on each steak; roll up and secure with wooden toothpicks. Place oil in a large cast-iron skillet over medium-high heat; add stuffed steaks and brown on all sides. Meanwhile, prepare gravy mix according to package directions. 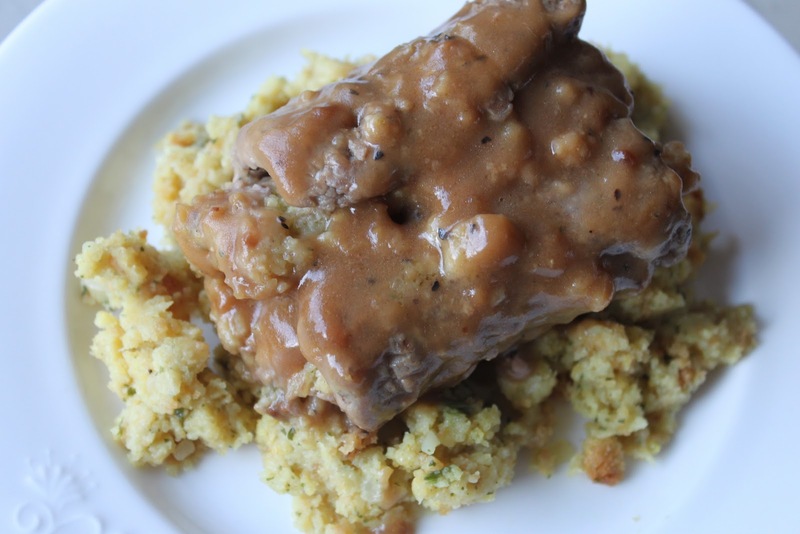 When steaks are browned on all sides, add gravy to skillet. Reduce heat; cover and simmer for about 10 minutes, until steaks are tender. Serves 4. I used beef cube steaks. In certain grocery stores in my area, they sell pork cube steaks. I'm sure those would be delicious, too. Since I was going to let the steaks simmer for a while, I added some extra liquid to the gravy. I had about a half a cup of leftover chicken stock so used that. Diced onions would be perfect in this, too. When my husband saw this, I thought he was going to cry. There's nothing the man loves more than meat smothered in gravy. And, throw in a box of Stove Top and he's in heaven. This is a delicious, man-pleasing meal! Click here to read the full review of Gooseberry Patch's Rush-Hour Recipes and to enter the giveaway for a copy of the cookbook. Thanks Mary! That's so sweet! Great recipe! My boyfriend will appreciate it too!